The weekend's over, but it's never too early to start planning the next one. I know I told you about it a few weeks ago, but in case you missed the announcement, The Midtown Lunch 5th Birthday Party is this Saturday! 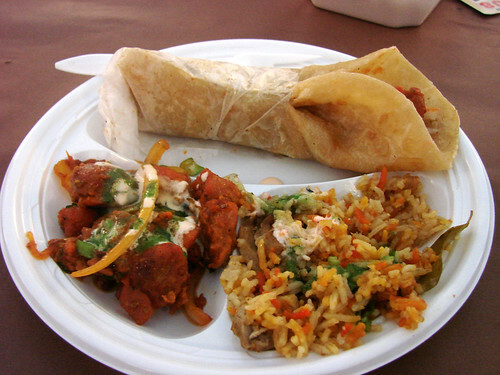 If you buy your ticket right now, you could win a $100 gift certificate to Bon Chon. Mmm, Korean fried chicken, drool. Did I mention this is your chance to meet us? 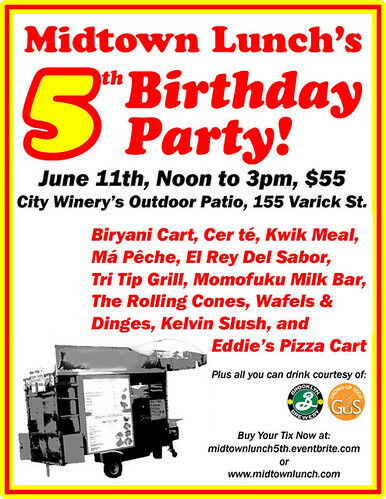 This Saturday at City Winery from Noon to 3pm, you can eat all the biryani Chef Meru will feed you, experience the world's first pizza cart, spike your Kelvin Slush (I'll have a flask), and then we can make the world's first Momofuku Milk Bar cookie ice cream sandwich with Mr. Softee ice cream twist! How can this be a bad way to spend part of your afternoon? Oh, and by buying a ticket you're entered to win one of the many prizes! Seeing as The Vendys this year are $95 and involve a ferry ride, having this be your weekend cart splurge of the summer is a no-brainer. You know you want to buy your tickets here! Again, the party's this Saturday at City Winery (155 Varick Street) from Noon to 3pm. Travels with Blondie: Kansas Has Carts! Three Tarts Makes Square Ice Cream Sandwiches?